When night falls, a new Barcelona shines out thanks to the talent of both artists from all over the world and students in our city who have mastered the transforming power of light. 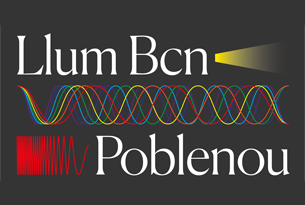 For the first time, the Poblenou neighbourhood will be illuminated. Poblenou has a peculiar physiognomy and an industrial past and is currently immersed in an intense process of transformation to turn it into a new district devoted to technology, innovation and creativity. The guest artist at Llum BCN 2018 is Monique Savoie, a Quebec video artist and founder of the prestigious Société des Arts Technologiques (SAT) of Montreal. In Barcelona, SAT, a leading foundation in the world art and the new technologies, will showcase a selection of the best immersive projections. Visitors can discover these at the new Family Space, which will also be open during the day on Saturday and Sunday to present various interactive projects.